Packed in an island below the equator is a land overflowing with beauty and mystery. In roughly 3 million square miles, Australia compacts a continent’s worth of landscapes, wildlife, activities, and people into a country sized space; appropriate, as it is simultaneously a country and continent. At the crux is Sydney, a hub of life as it is the most populous city in Australia and Oceania. 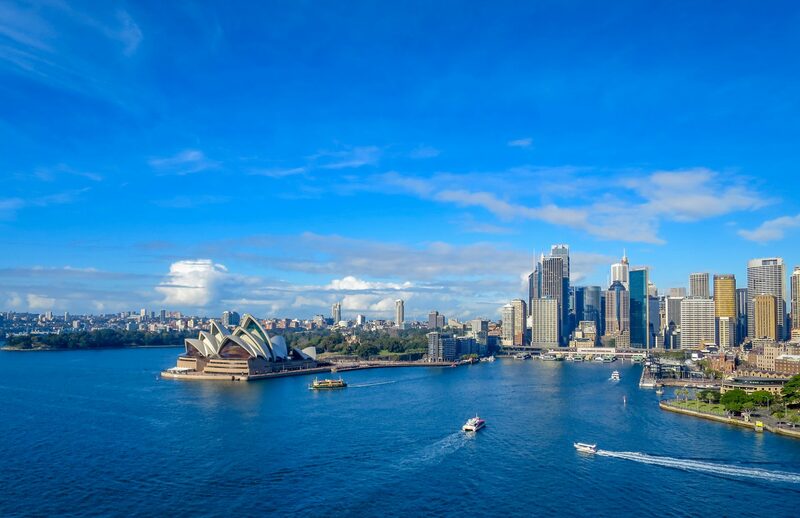 Housing one of the most iconic landmarks of Australia, the Sydney Opera House, Sydney Harbor is an ideal place to begin your yachting journey—one of the best ways to explore Australia. During the day, thrill seekers will rejoice as Australians don’t shy away from adventure including: skydiving, climbing the harbor bridge, white water rafting, heading bush, and more. For the fainter of heart, relax on one of the many picturesque beaches that span the coastline. Flush with cafes, craft beers, and quality wine, sip on some of the finest brews as you indulge in succulent seafood daily. Experience the harmony of vibrant city life with echoing tranquility of its surrounding nature as you cruise around Sydney, Australia. Your Sydney adventure starts when you meet the yacht in the heart of Sydney at Pier One Hotel, Walsh Bay. Enjoy your first glimpse of the Sydney Harbor Bridge and the Opera House during lunch. In the evening, the crew will take you by tender for a backstage VIP tour of the famous Sydney Opera House against the backdrop of your first Australian sunset. Begin your day in the inner harbor’s Athol Bay. Duck under the Sydney Harbour Bridge to the eastern suburb, Watsons Bay. Entering the bay families splashing in the water below Doyle’s Restaurant, serving a mouth-watering seafood feast, can be seen. For more adventure take a trip to Bondi Beach to join the throngs of surfers tackling the waves. Leave Sydney’s famous inner harbor and make way to the calmer waters of Middle Harbor. Test out your yacht’s water toys as you water ski, fish or kayak and take advantage of this harbor’s seclusion. After a leisurely breakfast on the aft deck, your crew will lift anchor and whisk you away towards Manly. Head ashore for a taste of beach-side Australian life at Little Manly Cove or practice surfing to help you work up an appetite for a long lunch ashore. Pass the Sydney heads—two towering sandstone cliffs marking the edge of Sydney Harbour—as you cruise from Manly to Palm Beach. Today dine at Berowra Waters, a restaurant exclusively accessible by boat or seaplane, for modern Australian cuisine, or Mod Oz, against a backdrop of international award-winning architecture. A protected National Park, journey to Ku-Ring-Gai Chase National Park to meet the local peoples and wildlife Australia has to offer. Get up close and personal with bandicoots, swamp wallabies, goannas, and native ducks sharing the trails with you. On your last day on board, head inland up the Hawkesbury River; try your hand at trolling for fish on the way. If you catch the big one, your chef will be more than happy to prepare it for you for lunch as you take in the sights one last time. The multitude of quiet anchorages make this the perfect spot to stop for a long, lazy swim and an even longer lunch before your disembark.